As wildlife biologists, we work with wildlife on a daily basis. So, what do we do on a day off? Why, go look for more wildlife, of course! We took off Friday morning to meet our good friend, Mary, in our backyard playground, Yellowstone National Park. While the summer in Yellowstone is fascinating and unique with it’s bubbling hot pots and active geysers, for us, winter is the season of the wolf. By Thanksgiving, most of the roads are closed to wheeled traffic and, while Old Faithful will see numbers of visitors traveling to it by snow coach, the northern entrance to the Park via Gardiner, has few tourists and is our easiest access to the wolf packs and the bighorn sheep – the two species we were off to find. Today I’ll tell you about our morning. Those who aren’t familiar with Yellowstone National Park tend to think of it as a zoo. They believe that one can just show up and the wildlife is everywhere for you to see, whether you’re looking for them or not. While that is true for some of the wildlife much of the time (you can be sure to see vast herds of bison in Hayden Valley in August and there’s almost always at least a few elk wandering around Mammoth), even Yellowstone wildlife is just that – wild, and not always available to the casual onlooker. But if you know where to look, how to look and when to look, then finding the harder-to-spot species like bears and wolves becomes easier. Still not guaranteed, but easier. For us, fall and winter are the time we go to visit the wolves. While we periodically see them in the summertime, the winter is the easiest time to find and observe them. We left our motel rooms around 6am and headed out to the Lamar valley. And we weren’t disappointed. 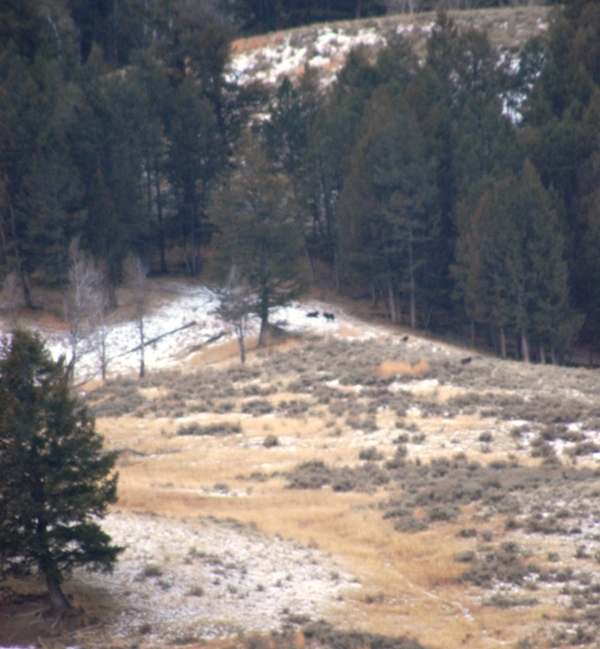 A wolf pack was lounging around in the aspen about a quarter of a mile south of the road. Out came the spotting scopes and the binocs and we all settled down contentedly to watch the wolves acting like, well sort of like dogs all having a grand social time. Not a surprise, of course – dog and wolf behavior have a lot in common, since that’s where our dogs descended from long ago. But all the same, there is something enthralling about seeing some of those same behaviors we see in our canine buddies acted out by the wolf – an animal that embodies the very essence of wildness. We had been watching the wolves for about an hour when one of them sat down, pointed his muzzle skyward and began to howl. Within seconds, the rest of the pack all added their voices to the first. And moments later, from the other side of the valley, unseen wolves responded and the valley echoed with the ululating songs. I put down my binoculars, sat back, closed my eyes and let the sounds wash over and around and through me. Not a bad way to start out a Thanksgiving weekend. Not a bad way at all. Craig: Today we broke ground, literally, for our second Bison Quest cabin. The upper few inches of the soil are now frozen and it required a pick to break a crack in the soil wide enough to get the tractor’s loader bucket below the frost line. Once through the frozen soil, the tractor’s hydrolics did all the work. This cabin will be 20×17 feet (our other cabin is 18×15 feet). We had 1280 linear feet of logs delivered last week for the new cabin. I worked late today until it was dark (about 6 PM), and when coming up from camp, Venus and Jupiter were a dazzling sight low in the southwest. In our solar system these are the biggest (Jupiter) and brightest (Venus), and they are side by side. If you have not seen this, it is worth a view. Although the 2 planets appear close, Venus is to the left of the sun, maybe 50 million miles or so away, while Jupiter is way out behind the sun maybe 400 or 500 million miles away. Venus is on the move and is changing position in relation to Jupiter each night. Jupiter appears higher in the sky than Venus because its orbital plain is different than that of Venus. A few years ago when Venus was a morning star, I did an experiment to see if Venus (about -2 magnitude) could be viewed with a telescope during the day. To my surprise, I had no problem seeing Venus 3 hours after sunrise. A few days ago I tried the same thing with Sirius, the brightest star in the northern hemisphere (about -1 magnitude), and it was faintly visible when the sun was illuminating Six Mile Mountain, but I don’t think Sirius would be visible in full sun light like Venus. However, at night through the telescope, Sirius is a brilliant blue-white star. Pam: You know, there’s a saying that “in nature nothing ever goes to waste”. We set our remote camera up at some deer remains on the ridge for 36 hours and had some good chuckles over the results. We got 523 pictures (the camera will take one picture/minute) and 500 of them were full of Magpies. Now, I love Magpies – they are gorgeous and fascinating and smart. But 500 pictures!! Anyway, the other 20 or so pictures were of a Golden Eagle, Rough Legged Hawk, and a few Ravens. We’re setting the camera up again today and I’ll post our results later in the week. It’s kind of like Christmas – you never know what you’re going to get! Welcome to Wild Echo Bison Reserve and our Bison Quest Adventure Vacations. While our website (and we) have been around for a few years, the idea of a blog is a new one. Well, maybe not a new idea, but certainly a new idea for me. With my “love” for computers (that, for those who know me, is using extreme sarcasm), the idea of actually subjecting myself to this hateful task on a regular basis is intimidating, to say the least. But in the end, the desire to share what we have here, to make a difference in our exciting, awesome and incredible wild world around us in even a small way, is overwhelming. So here I am. With a blog. We’re always being asked how, and why, Bison Quest was started. I’ll talk about the “how” some other time, but the “why” seems as good a way to introduce us as any. We – all of us- live in a fascinating and intricately connected world, but I’m often amazed, and dismayed, at how little of it most of us understand. Or are even aware of. And, if we aren’t aware of it, then how can we save it? How can we save us? And that, in a nutshell, is why we wanted to bring Bison Quest into existence. Because Craig and I want to share the natural world with those of you who live in worlds of concrete and steel and asphalt, but know that there’s more to life than that. To those of you who know that this world around you is worth exploring and understanding – indeed, is critical that it be understood. Because, in the end, what happens to this complicated world outside of our cities and towns, is where the future lies for all of us.